“A truly dramatic shift in Americans’ eating behavior is playing out in the area of fat consumption. Animal fats, demonized for decades as prime contributors to obesity and heart disease, are being rehabilitated as new research calls their culpability into question. The emerging generation of Millennial consumers has embraced animal fats for their chemical-free purity, and at the same time the Food and Drug Administration has outlawed artificial, plant-based trans fats. The net result is a big, fat renaissance for classic ingredients like butter, lard, beef tallow and more.” ~Nancy Kruse, Nation’s Restaurant News, March 28, 2016. Nation’s Restaurant News, March 28, 2016. We are nearing the end of one of the worst man-made disasters in human history. Our epidemics of obesity, diabetes, and many other illnesses and conditions coincide perfectly with the advent of fat phobia. Good, natural fats are back in vogue and many of us are making up for lost time. We are no longer avoiding fat, but are actively seeking ways to get more healthful fats into our diet to make up for what is missing in our modern food supply. Butter coffee and fat “bombs” have become popular to keep us burning fat instead of burning sugar and storing fat. Here is a recipe with a mother-load of good fats! Grease a 3- x 5-inch glass container (slighter larger if you use the optional nuts) and line with parchment paper, letting the paper hang over on two sides to facilitate removal. Grease the paper also. 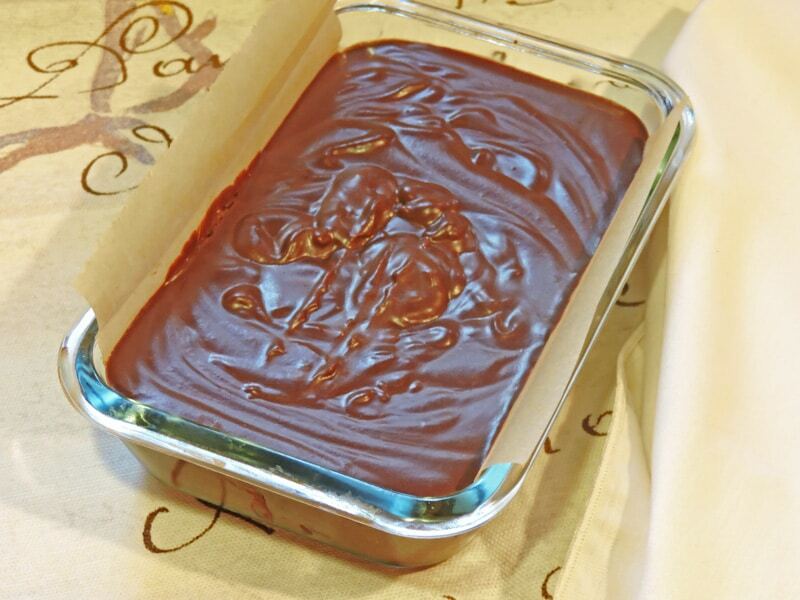 Chop cocoa butter into small pieces so it will melt easily and place in a heat-resistant bowl. Cut up butter and coconut oil and add to bowl. Stir in MCT oil and vanilla and any liquid sweetener, if using. If using a granular sweetener, grind it to a powder in a food processor or coffee grinder. Add cocoa, collagen, and salt to powdered sweetener and pulse or whisk until blended. Make espresso with a rounded ½ teaspoon of espresso powder and ½ cup boiling water or use ½ cup strong, hot, brewed coffee. Place in a second bowl. Stir butter, cocoa butter, and cheese into hot coffee and stir until melted and smooth. Reheat as necessary until everything is melted. Stir in vanilla and any liquid sweetener, if using. Add dry cocoa powder, sweetener, collagen, and salt mixture into coffee and fats mixture and whisk or beat with an electric mixer until thickened. Stir in optional chopped nuts, if using. 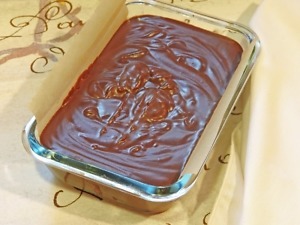 Pour fudge into the prepared container. Cover and refrigerate for several hours until set. 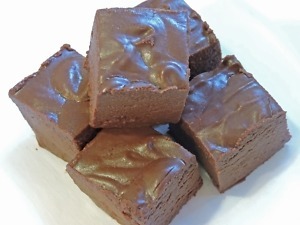 Cut into small squares as it is very rich. For firmer fudge, store in freezer. Can be eaten frozen, chilled, or at room temperature depending on how firm you like it. Sweetener is not included in counts. Most have little impact. **Dutch process cocoa has been alkalized by washing with a solution of potassium carbonate to neutralize the acidity of natural cocoa. It is milder and darker than natural cocoa and has fewer grams of carbohydrate. Since this recipe is not cooked, natural cocoa gives it a sharper, more acidic, “raw” taste. 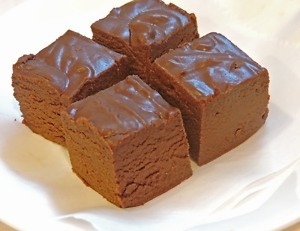 Dutched cocoa makes smoother, more mellow tasting fudge. ** You can replace the grass fed butter with coconut oil (the fat from coconuts) or use a combination in this recipe. ”Butter, Chocolate, Fudge, Good Fats. Bookmark. You are welcome! Thanks for reading (and putting up with all my mistakes until I learn how to use Word Press). My computer crashed before I finished the post. It is up now! This looks amazing! Is there a dairy free version? You can use coconut oil instead of butter and coconut butter instead of cream cheese. (Coconut butter includes the meat and the oil from coconuts.) Your fudge might be a bit firmer, but you might like that better! Is that collagen powder “hydrolysate” (i.e. : it won’t gel) or is it plain unflavored gelatin?!? Crud, I could have got some with my Jet.com order the other day (DOH)…. Hi John. Yes, you want collagen hydrolysate, not plain gelatin. Great Lakes sells it in a green can; the orange can is gelatin. Collagen hydrolysate is a precurser to gelatin. The Bulletproof Executive also sells one and Dave explains the difference on his site. Okay, but can I use something else instead of that? I don’t want to spend $20~$53 on something I will only use for this one recipe. You can probably use whey protein or any other protein powder, such as egg white protein. I haven’t tested with anything else, but it should work. Let us know how it turns out, OK?. Okay, using whey protein powder (Jarrow) seems to work just fine, although I did add about a Tbsp more, to give it bit more body. I think that was because I was using coconut oil, and it was pretty soupy before adding the protein powder. I was able to just refrigerate them after a couple of hours in the freezer. I also used “super concentrated” dutch processed unsweetened cacao powder, which caused me to put a bit more erythritol in there too. Now you have me drooling too, John Smith! I think they would be great as frosting–what a good idea. I’m glad you liked the recipe, thanks for the feedback.